GPSEN has been acknowledged as a Regional Center of Expertise (RCE) on education for sustainable development (ESD) by the United Nations University Institute for the Advanced Study of Sustainability. Both GPSEN and RCE Greater Portland will be used below. One of the most widely cited definitions of sustainable development is “development that meets the needs of the present without compromising the ability of future generations to meet their own needs.” This definition was first provided by the World Commission on Environment and Development in its 1987 report to the United Nations General Assembly. The report was called “Our Common Future [pdf]” and is also known as the Brundtland Report. What are Regional Centers of Expertise (RCEs) on Education for Sustainable Development? An RCE is a network of organizations within a region that facilitate and deliver education for sustainable development (ESD) to local communities. The education may be formal (e.g., classroom), nonformal (e.g., educational arms of organizations), or informal (e.g., the media). The RCE program is a global initiative of United Nations University, designed originally to support the UN Decade of Education for Sustainable Development (2005-2014). As of August 2018, there were 165 RCEs worldwide. Transformative education: contributing to the transformation of the current education and training systems to satisfy ambitions of the region regarding sustainable living and livelihood. What benefits do RCE recipients receive? One of the most important benefits for RCE participants is the impact they can have by identifying common objectives, aligning agendas for solving specific problems, engaging in collaborative projects, and leveraging shared resources. The collective impact will be far greater than any individual organization acting on its own. Given the limits in funding, time, and capacity that many groups face, none of us want to add more work to our plates. So, we encourage finding ways to discover synergies, in order to increase efficiency, avoid replicating work, and create win-wins. Another important benefit is the learning that takes place when RCE participants connect with other providers of education for sustainable development, both in their own region and around the world through relationships with other RCEs. The RCE network supports, promotes, and accelerates the work of all participants. What is "Education for Sustainable Development?" Education for sustainable development (ESD) helps learners develop the attitudes, skills, perspectives and knowledge to make informed decisions and act upon them for everyone’s benefit, now and in the future. ESD is often used interchangeably with the terms “education for sustainability” (EfS) and “sustainability education,” though meanings may vary slightly. The following characteristics of ESD are adapted from this definition by UNESCO (United Nations Educational, Scientific, and Cultural Organization). is interdisciplinary; no single discipline can claim ESD for itself – all disciplines can contribute. What are the Goals of RCEs? The purpose of an RCE is twofold: to promote transformative education that encourages sustainable lifestyles and livelihoods in a region, and to share knowledge and insights with other RCEs around the world. RCEs aspire to achieve the goals of the U.N. Decade of Education for Sustainable Development by translating its global objectives into the context of their local communities. RCEs provide platforms to share information and experiences and promote dialogue among regional stakeholders through partnerships for sustainable development. They also develop regional knowledge bases to support ESD and promote its goals in a resource effective manner. Lead advocacy and awareness raising efforts to raise public awareness about the importance of educators and the essential role of ESD in achieving a sustainable future. RCEs promote the long-term goals of ESD, such as environmental stewardship, social justice, and improvement of the quality of life. Organizations providing formal, non-formal, or informal education for sustainable development within a region participate in RCEs. This includes higher education institutions, K-12 schools, businesses, government, the media, museums, zoos, gardens, and civic associations. Many individuals also participate, from scientists, researchers, students, and teachers to community members and life-long learners. Partners are encouraged to identify key regional sustainability issues and develop educational initiatives that address these issues and align with the sustainable development goals (SDGs) identified by the larger global community. The dedicated focus of the RCE network on outreach, collaboration, and research in ESD recognizes the vital role education plays in the broad transformations needed for more sustainable ways of living. To date, GPSEN has relied on in-kind and financial support from participating organizations, especially academic institutions. It also relies heavily on the voluntary contributions of individuals. If you would like to support GPSEN, please see our Donate page. What is the geographic region of RCE Greater Portland? 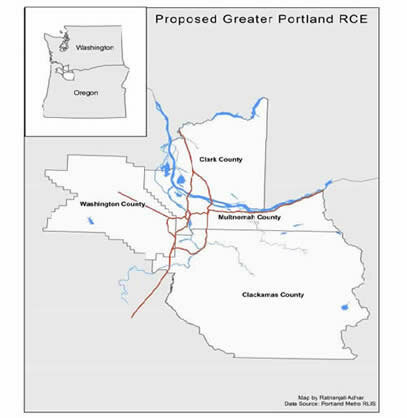 RCE Greater Portland has a four-county geographic scope that includes Multnomah, Washington, and Clackamas counties in Oregon, and Clark County across the Columbia River in Washington state. These four counties comprise the planning area for many regional sustainability efforts, including initiatives by Portland’s regional government, Metro. The cities of Vancouver (in Clark County) and Portland (in Multnomah County) are highly interdependent, and therefore any meaningful sustainability efforts must span both communities. What are the issues identified by the region as a priority for Education for Sustainable Development? We identified four major priority areas for the region’s sustainable development: environment, education, economics, and equity. Facing growing issues of water and air pollution, struggling schools on tightening budgets, high unemployment rates, and racial discrimination and inequities, we recognize the critical need to collaborate across sectors in educating and empowering all residents to address these challenges. Why is recognition as an RCE by United Nations University important for the greater Portland region? The RCE allows the greater Portland region to connect with other RCEs and regions around the world that are shaping best practices in education for sustainable development (ESD). This important networking opportunity is supported and made possible by the United Nations University Institute for the Advanced Studies of Sustainability. RCE Greater Portland enables the region to identify, understand, and build on ESD opportunities at a regional level while learning from the educational experiences of others around the world. What are the vision and goals of GPSEN / RCE Greater Portland? Please see our About page for our mission, vision and goals. An important outcome of our activities is the development of leadership for a sustainable future. Our programs create the conditions to cultivate knowledgeable, engaged global citizens who embody sustainability values and behaviors in everything they do. Some of the ways we accomplish our goals include collaborative research projects, educational events, policy discussions, professional development opportunities, specialized resources, and public awareness and outreach campaigns. Who has participated in developing GPSEN / RCE Greater Portland? A Coordinating Committee of over twenty individuals from local educational institutions, government agencies, non-profits, and business helped guide initial efforts to establish the RCE and apply for United Nations University recognition through the UNU’s Institute for Advanced Studies of Sustainability. These efforts included outreach to more than 100 stakeholders in the region and several large meetings with stakeholders. As of April, 2014, there were about 236 RCE participants subscribed to our listserv, plus 80 member institutions and organizations (see list of participating organizations). Many individuals are actively involved on RCE committees and working groups. Please join us! When was RCE Greater Portland developed and formally recognized? Preliminary meetings to develop an RCE for the greater Portland region began in November, 2012. With regular application committee meetings and quarterly stakeholder meetings through the winter and spring of 2013, the first draft of the application was submitted to the United Nations University’s Institute of Advances Studies (UNU-IAS) in June 2013. With feedback from the UNU-IAS and our mentor, RCE Saskatchewan, a final application was submitted in September 2013. Formal recognition as an RCE was received from the Ubuntu Council of Peers and the United Nations University Institute for the Advanced Studies of Sustainability (formerly “Institute for Advanced Studies”) in December 2013. Stakeholders chose to adopt the local name of the Greater Portland Sustainability Education Network (GPSEN), in March, 2014. While formally an RCE, we wanted our mission to be clearly represented in our name. An official launch and celebration is planned for June, 2014. Please check Events on our website for more information. Receive the latest opportunities and news in sustainability education. Our bi-monthly newsletter contains the latest updates to the Regional Hub and GPSEN programs.